One’s ability to navigate and understand place depends on maps, language, past experiences and contextual clues. Now, more than ever, past experiences and expectations for what’s at a library don’t match the reality. Your collection now includes more digital resources and technology with an emphasis on content creation and consumption. Combine this with shifting U.S. demographics, and it’s more important than ever for libraries to fine-tune wayfinding signage and strategies. One of the most insightful practices, prior to developing a signage strategy, is to conduct user observations. You’ll gain fresh insights as you view your space through a new lens and observe patrons, keep the following 2 principles in mind. Wayshowing is the idea of welcoming, orienting and guiding patrons throughout a space. When visitors enter your library, is the space open? Does it allow for transition and assimilation, or do visitors need to quickly determine where to turn next? Visibility, clarity and simplicity are primary considerations in signage decision-making. The American with Disabilities Act (ADA) guidelines recommend that letter height be 4″ to be visible from 100 feet away. Typical overhead signage guidelines are at least 3″ high characters and numbers when suspended 80″ overhead. Forging Confidently Ahead or Awkwardly Searching? Wayfinding signage reinforces to visitors that they’re on the right path. Until their destination is reached, patrons are continually searching, making decisions and moving in a direction, repeating this process as often as necessary. Wayfinding can lure browsers to new places and serve as a navigation tool, guiding those with a specific need or destination. As you survey the interior horizon, are there ceilings, columns or visible corners you can leverage? It is important to note places where patrons must make choices on which path to take. These are all potential locations for signage or graphics. As you evaluate your signage options, remember that a cohesive and consistent presentation of design, font, colors and placement assist visitors, and can serve as triggers for where to seek out information and what information they will find. Clear, jargon-free word choices will help ensure patrons understand your intent. Through your observations, you should have gathered a broad range of insights that address the hierarchy of information needs. 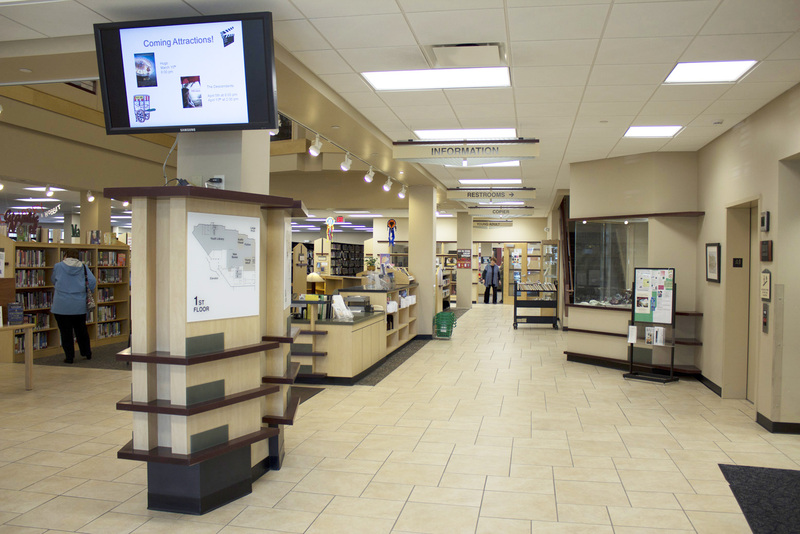 The goal of your signage plan is to have just enough signage to strike the right balance of guiding, directing, informing and instructing library visitors in a manner that enhances their experience. It’s easier to engage people who are already at your library than to bring new users in, but trying to cover all this ground could lead to “signage overload.” Graphics, colors and furnishings can be used to indicate space and act as visual clues before reading a sign. A guiding principle of signage is less is more. Strive for simplicity and effectiveness. Mollerup, Per. 2013. Wayshowing>Wayfinding: Basic & Interactive. BIS Publishers.